Multimedia artist Christina Balch creates self-portraits and, in the process, explores concepts of self-portraiture in an interconnected age. Recently, we asked this question of a group of artists in different disciplines, and I’d be curious on your take: How much of the self is in your art? My most successful artwork has included much of my physical self in it – usually in the form of a self-portrait. My latest project titled Awake features hundreds of photos of myself first thing in the morning. You could say the project is a “selfie” project because I am taking photos of myself with my cell phone. When someone takes a selfie, they are curating their “self” image and often projecting that curated self-image online for the digital world to see which is what I am doing with Awake. I try to capture my self image without judging myself or trying to look a certain way in the photo, unlike the typical selfie which is heavily edited. Each Awake photo is an intimate look into my everyday life doing one of the most mundane and universal actions in the world – waking up. There’s nothing shocking in the photos, but subtly I reveal messages about my beliefs related to technology, feminism, and self-perception through the content of the photos and the way I deliver them to my audience. I post all of the self-portraits to public websites which then forms my online identity. How did your November ’14 TED talk come about for you? I found the opportunity to give a TED talk through my last day job which had little to do with my art practice other than funding it. I worked for a corporate institution in Boston in their marketing department for three years. Many artists support themselves and their practice with different jobs, and for me that has been work in the digital marketing industry. Last year, employees were asked to submit applications to give a TED talk about any topic under the sun. I submitted a talk and exhibition proposal of my Awake project, and to my surprise it was accepted along with eleven other talks. I never thought that one of my marketing jobs would offer me the opportunity to exhibit my art, not to mention send me to London to show my Awake photos and give a TED talk about it. For me, it highlighted that opportunities to share my artwork can be found in unexpected places as long as I am open to them. What’s the most surprising response to your Awake project you’ve ever received? I spoke with a psychologist about my Awake project after I had given a short talk about it at Danforth Art in Framingham last year. The psychologist had been working with elderly people to help them come to terms with their age and mortality. After learning about my project and my motivations behind it, she thought her patients might benefit from a similar exercise. She thought that if her patients repeatedly took photos of themselves, they would be forced to confront their aging bodies and hopefully accept themselves as they are physically. I love this take on my self-portrait project because most of the comments I receive about the Awake project relate to the selfie culture among young people, primarily girls and young women. What’s the most embarrassing line of an artist statement you’ve ever written? “I am obsessed with suffering.” When I first built myself a website in 2007 it was very dark and sinister visually, and I used this line in my artist statement that I put on the website. I was interested in the Buddhist notion of attachment and suffering at the time, but the line in my statement came off as overly dramatic and didn’t resonate with the paintings I was creating then. When my fiancé makes fun of me for being overly dark or melancholy, he often recites that line. I still dread writing and editing my artist statement. I love writing words on paper so I much prefer longhand. Often I write things like emails or blogs on paper first, then type them out on my computer later. Summer, hands down, even in New England. I’m from Southern California so I like the heat even if it’s sweaty, Boston heat. Winter is my second favorite in Boston because I get to hibernate in my studio for a few months. I’m having a lot of fun playing around with animation and film during my artist residency at the Morija Arts Centre in Lesotho, Southern Africa. We’re doing old school stop-motion animation using paper cut-outs with the animation students at the center. I have been doing some of this myself and also playing with charcoal animation à la William Kentridge and other experimental media. I plan to use some of these techniques in my next projects. 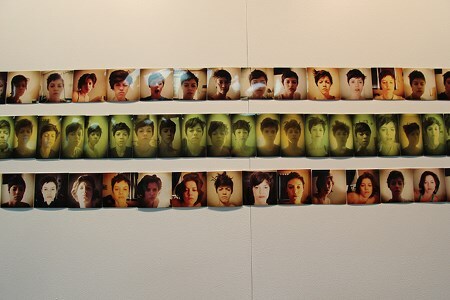 Christina Balch is a multi-media artist whose work has been exhibited in the Boston area and in Los Angeles. Most recently her ongoing project Awake was installed at Gallery 263 in Cambridge, Massachusetts, and at TED@StateStreet in London. Currently, Christina is further exploring portraiture as an artist resident at the Morija Arts Centre in Lesotho, Southern Africa where Christina was a Peace Corps Volunteer in 2007-2009. 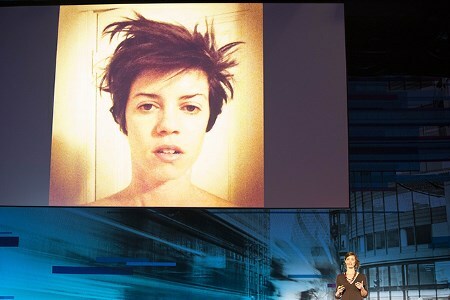 Images: self-portrait grid from the AWAKE project by Christina Balch; Christina Balch presents and an installation detail of AWAKE by Christina Balch, both from TED@State Street salon at Troxy, November 18, 2014, London England.